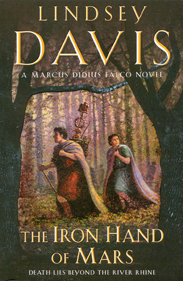 Roman history in Europe provides the setting for Falco and his tasks in this novel. Germany is three: Germania Superior, Germania Libera, and Germania Inferior. During this era of the novels, Rome has provinces, governors, legions and forts dotted all over what we now call Europe. But it was not without clashing of steel, conflict, battles and rebellions. This novel focuses on events in the region of Germania Superior and Germania Libera, with the Rhine River being somewhat a line of demarcation between civilisation and barbarity. The swathe of territory traversed scopes from Arles to Vienna, Lugdunum (Lyon) to Argentoratum (Strasbourg), and on up via Morguntiacum (Mainz), Castrum ad Confluentes (Koblenz), Bonna (Bonn), Agrippinensium (Cologne), Novaesium (Neuss), and to Vitera, (Xanten), an unusually named town which still holds this name today, along with an archaeological park full of restored Roman Artefacts.